Seriously? OMG! WTF?The Kardashians Archives - Seriously? OMG! WTF? Could Khloe Kardashian be the Bachelorette? In case you have been living under a rock this week, Khloe Kardashian dumped her baby daddy because it is rumored he was having an affair with her sister’s best friend. We know she loves roses, men and fame, so she needs to make it happen. It would be the one season where the Bachelorette is more interesting than the suitors. They would just be there as eye candy as her family tries to tell her what to do. You know she is not going to do it by herself. Do you ever only get just one of them? Would you watch if she was the one handing out the roses? Did Weird Al Yankovic prank KimYe? Kanye West got his wife, Kim Kardashian, Kenny G for Valentine’s Day, but what does the rapper know about the saxophonist? For all he knows, he could have hired Kenny G’s doppelganger Weird Al Yankovic and not even know it. Did he? The above photo posted by the Schlock rocker seems to tell that story. What do you think? Not sure, then watch the video below for more information. 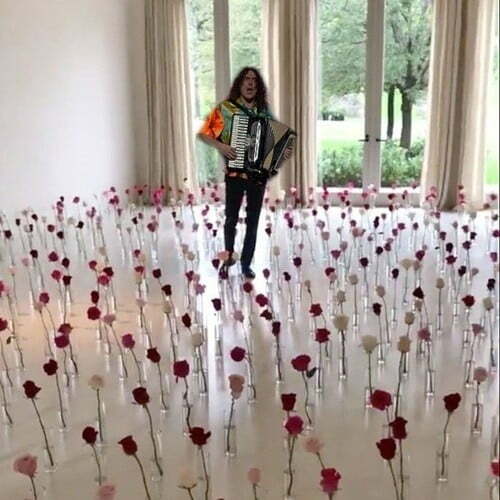 Oh and ignore the Kenny G’s tweet, “Thanks for having me be a part of your Valentine’s Day ” Maybe that is his way of throwing them off the scent? Just what the world needs, another Kardashian! As if there are not enough Kardashians in the World, another one is on the way. Who is having a baby? Is it Kourtney? Kim? Khloe? Rob? Kendall? Or Kylie? It is…Kim and Kanye West. The couple is expecting their fourth child together and second via surrogate according to Us Weekly. Baby #4 joins Chicago, 11 months, Saint, 3, and North, 5. KimYe’s son is due to make his camera debut in May. Kris Kardashian and her five daughters Kourtney Kardashian, Kim Kardashian, Khloe Kardashian, Kendall Jenner and Kylie Jenner all posed together on a couch giving us half of the peace sign. Just when you thought that they could not act any more klassier they do something like this. I wonder who they were giving the finger to? I would like to assume it was to Kanye who said he would bang all of them. So sent shivers down my back when he revealed that. What is Khloe Kardashians saying about her sisters with her new show? Khloe Kardashian is producing a new show on Investigation Discovery called Twisted Sisters and I wonder what drew her to it? The six-part series tells the story of sisters committed some of the most shocking crimes. Sometimes they worked together, other times they turned on the other one. The investigative series will interview immediate family members and close friends to learn what triggered the sisters’ path towards a life of crime. The show will also talk to investigators to learn more about the crime and how they were able to solve it. I wonder if she is trying to say there is a sibling rivalry between her and her sisters? When it comes to which sister I think she would commit crimes with, I would say Kylie Jenner. When it comes to which one they would conspire against, that has to be Kim Kardashian. What do you think? Twisted Sisters debuts September 3rd on ID. To read descriptions of the six episodes, then click here!